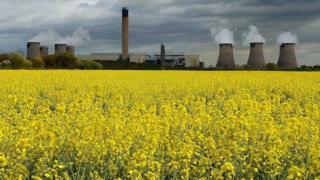 Energy company Drax has abandoned a £1bn project to introduce carbon capture technology to cut emissions. Drax is part of a scheme to store carbon dioxide next to its plant in North Yorkshire, which is the biggest coal-fired power station in the UK. It is halting further investment because of the government's decision to reduce subsidies for renewable energy. The company said that due to lack of profits it had to put the business and shareholders first. Drax chief executive Dorothy Thompson said it was a very sad decision and they thought the White Rose project still had a lot of potential. Speaking to the BBC, she said: "The most recent effect has been the government has removed a tax exemption for renewable power that is sold to industrial companies and we're the largest generator of renewable power in the UK and this has suddenly removed a stream of income." "The day it was announced our share price dropped by a third and that simply reduces the amount of cash we have available for future investments." The government has reduced support for the use of wood pellets, a renewable biomass fuel, that the company now burns at its plant in North Yorkshire. Over the summer it also cut renewable energy subsidies, saying it was keen to reduce fuel costs for consumers who paid for them through their bills. Drax said the White Rose carbon capture and storage (CCS) project had the potential to trap up to 90% of carbon emissions from a new coal fired power station next to the company's existing power plant in Yorkshire, which would be stored beneath the North Sea. It said it was fully committed to the completion of the feasibility study which is due to conclude in the next six to 12 months. Even though it will not be committing any further investment it will make its site and the power plant's infrastructure available for the project to be built. Its other partners in the consortium, called Capture Power Ltd, are energy technology firm Alstom and industrial gas supplier BOC. Capture Power said it was still committed to delivering the CCS project and a final investment decision would depend on the outcome of an engineering and design study. Capture Power is one of two bidders competing for £1bn of government money to build Europe's first carbon capture plant on a commercially operating power station. The other is Peterhead's gas fired power station in Aberdeenshire, which is being developed by Shell and Scottish and Southern Energy (SSE). The chair of the Energy and Climate Change Committee, Angus MacNeil, said the government must take some responsibility for Drax's decision. "They certainly didn't consider what they were doing and they've left Drax in a very invidious position at the moment. Drax itself would have been actually carbon negative, in that they were burning biomass and then were going to be storing that capture, so they would have been taking carbon out of the atmosphere." "So what Drax were doing was very exciting. And this is a very unfortunate situation. But in many ways it's actually when you think about it not surprising, due to the wrecking ball approach the UK government have taken." he added. Ms Thompson said dramatic changes in commodity prices had also affected the firm's financial situation compared with two years ago. She said the company would now be concentrating on biomass technology which she said was "the most affordable, the most reliable and the fastest move away from fossil fuels" to the energy of the future. In statement, the Department of Energy & Climate Change said: "CCS is set to play a vital role in decarbonising the electricity sector and heavy industry. "The government remains committed to assisting the development of CCS in the UK and to the CCS Competition, continuing to negotiate with the two preferred bidders."